Many vegetables are enjoyed raw, so why not corn? Like broccoli, carrots, green beans and zucchini, fresh corn—eaten on the cob or sliced off it—is delicious. When we get home from the farmers market with our fresh-picked corn, we husk and enjoy an ear on the spot. No butter or salt is needed—in fact, the unadorned sweetness of the fresh corn is a-maizing. As a side for dinner, toss the raw kernels with bit of fine olive oil and a pinch of sea salt. It needs no further garnishing, but you can add some grated Parmesan or cracked pepper. Take a bite: There’s no need to cook! Photo by Zeeshan Qureshi | SXC. Each ear of corn (10 to 14 oz.) will yield about 1 cup of corn kernels. Here’s a video showing an easy way to remove the kernels from the cob. 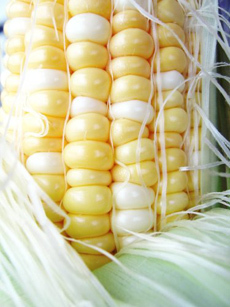 To eat raw corn from the cob, it needs to be fresh and sweet. The moment it’s picked, the sugars in corn begin to convert to starch. Two days later, the corn can taste starchy rather than sweet. It’s easy to tell if the corn is fresh by looking at the silk tassel. It should be a light, whitish color. As the corn ages, the silk turns brown. The corn can still be good as long as the tassel is not dried out. If the tassel has been removed, don’t buy the corn. It means the silk dried out and the corn is too old. If your mother taught you to peel back the husk before buying the corn, forget it! All it does is dry out the corn. If the tassel and husk look fresh, there’s nothing to see. If a few kernels are missing from the top of the cob, it means nothing. Don’t husk corn until you’re ready to use it. Eat corn the day you buy it. Keep it in the fridge until you’re ready to eat raw or cook.